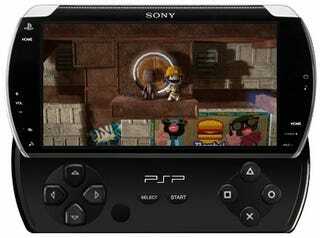 Ars Technica has it from a "very well-informed mole" that the rumored flash-based PSP Go! will be announced at E3, and later sold alongside the current model. As for that PS3 Slim, it's real too, but don't expect an announcement next week. Ars seems pretty confident about these reports, but they're suspiciously close to a plain recapitulation of recent rumors. Either their mole is correct, and all the wild speculation about both the PSP and PS3 slim has been spot on, or he has no idea what he's talking about, at all. Either way, assuming that the PSP Go! has no UMD support, keeping the PSP-3000 is kind of necessary on account of just how many games have already been sold for the format. Ars's source says it will be lighter and smaller than its predecessor, and strangely, maybe even cheaper. The PS3 Slim would be par for the course for Sony, who has eventually miniaturized every console they've ever made, so to make the prediction that they'll make one someday isn't overly bold.